Do you have a ton of business ideas or lots of stuff that interest you, but you can’t seem to focus on just one of those ideas? Emilie Wapnick says you don’t have to focus on just one thing. It’s possible to do everything you want as a multipotentialite, someone who pursues multiple passions and interests. 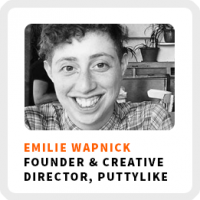 She’s the founder and creative director of Puttylike, a tribe of multipotentialites figuring out how to everything they want to do. She’s also the author of How to Be Everything. Check out her amazing TED Talk on being a multipotentialite below! Four commonly used work models that Emilie noticed in successful and happy multipotentialites. Pushing through judgment when pursuing something out of the ordinary. What makes a good and worthwhile mastermind group and how to put it together. Finding new, exciting things to try within the realm of her work. And check out Emilie’s Multi-Passionate Must Haves for 2018! It’s just $97 starting on May 15th. This super special offer is only available for just 3 days! Core work activities + habits: 1) General community activity to keep a feel or the pulse. 2) Overseeing the blog and doing some writing. 3) Working on the bigger projects. Ideal work environment: In the morning, sometimes in a cafe or in a nice, quiet office with some tea. Regains focus by: Taking a break for a hike or to take the dog out. 90-day goal: Getting her bundle sale launched. 2) Break down what you’re trying to learn into the smallest things possible and start there. Get Emilie’s Multi-Passionate Must Haves for 2018 for just $97 starting on May 15th. This super special offer is only available for just 3 days!